Brought in as pets, the Burmese python and the Nile monitor lizard are eating their way through Florida’s endangered species, said Chris Sweeney in Audubon. Now more exotic reptiles may join them. It's a sweaty June morning on the outskirts of Tampa, and droves of reptile enthusiasts are streaming into an air-conditioned expo center. Some have woken early to trek out to the Florida State Fairgrounds to get first crack at the animals of Repticon, a weekend-long extravaganza that’s similar to a baseball card convention, except instead of mint-condition Mickey Mantles and Pete Roses there are green anacondas and meat-eating lizards. A guy strolls by wearing a “Snakes Lives Matter” T-shirt. Another man, who has a 3-foot-long lizard slung across his chest like a bandolier, is at a nearby booth admiring a young boa constrictor that’s twirling around his girlfriend’s fingers. Price? $100. Sold. Roughly 60 Repticons take place each year, from Phoenix to Oklahoma City to Baltimore, attracting an estimated 200,000 visitors. These shows represent but a tiny sliver of the live-reptile trade. In much of the continental United States, these cold-blooded creatures aren’t likely to fare well outdoors should they escape or be set free. But the subtropics of South Florida are different, and the best adapted have not only survived in the wild, they have thrived. To date, the Florida Fish and Wildlife Conservation Commission, or FWC, has identified 50 types of non-native lizards, turtles, crocodilians, and snakes within state limits, more than anywhere else in the world. For the birds of Florida, this blitz of exotic predators poses an existential-scale threat. The Burmese pythons, which stalk wading birds in the Everglades, have become so menacing that the state has hosted derby-style competitions to catch them. Farther north, Nile monitors—the largest lizards in Africa—have been terrorizing a population of burrowing owls in the city of Cape Coral. And on the outskirts of Florida City, just outside Everglades National Park, egg-eating Argentine tegus could soon raid the nesting grounds of one of the last remaining populations of the endangered Cape Sable seaside sparrow. Each of these reptiles found its way to Florida via the pet trade—but while most people acknowledge that’s a leaky pipeline, few agree on whether and how to plug it. Take Ed Poelsma, who’s wandering Repticon with Pugsly, a 5½-foot-long black-throated monitor that’s a close relative of the Komodo dragon. Pugsly is a stunning creature that looks to be from prehistoric times, with claws like steak knives, camouflaged skin, and a muscular tail. What does Pugsly eat? “Meat,” Poelsma says. “He would eat anything you put in his cage that’s meat. Literally anything.” You don’t need a permit to buy a Pugsly of your own, and that’s how Poelsma thinks it should be. It’s a sentiment that almost everyone I meet at Repticon echoes, including Greg Graziani, who has starred on National Geographic’s The Python Hunters and now runs a reptile-breeding facility. “The bird people are worried,” he says. “I understand their concern. But I haven’t seen the science.” Truth is, scientists have never seen anything quite like this. It's the Monday morning after Repticon and I’m in a vacant lot in Cape Coral watching Bob Mondgock smack a package of frozen chicken with the claw end of a hammer. He pries free a hunk of raw poultry and tosses it to the back of a spring-plated trap in hopes of luring in one of the invasive Nile monitors that haunt this Gulf Coast city. Mondgock works for the Cape Coral Environmental Resources Division, a six-person unit that could easily have been the inspiration for Parks and Recreation. Over the years, he has tangled with more monitors than he can remember. Nile monitors have no business in this hemisphere. As their name implies, they should be basking along the shores of Africa’s Nile Delta, but they got popular in the pet trade, and rumor has it that the owner of a now defunct pet store, scheming a source of free inventory, let some loose behind his shop so they would breed in the wild. These reptiles can top 7 feet, swim like Michael Phelps, and eat rodents, birds, rabbits, wasp nests, venomous rattlesnakes, poisonous cane toads, and, according to some residents, cats and dogs. There’s no telling how many Nile monitors are out here. Since 2000, the city has logged more than 2,500 sightings and trapped 564 of the animals. Over all those years, though, no one has uncovered a monitor nest, an unsettling tidbit given that the lizards can lay up to 60 eggs at a time. Conservative estimates put their population at 1,000, a lowball number in Mondgock’s eyes, because many residents are so accustomed to the animals that they don’t bother calling one in. Today, Mondgock will bait 11 traps, all within view of nice homes with pools, screened-in porches, and garages. It’s known that Nile monitors eat burrowing owls—after all, the lizards are expert burrowers and ground hunters. What’s unknown is the number of owls they have devoured. One of the first confirmed cases dates to May 2005, when a woman saw a large monitor in her yard with a tawny in its jaws. Unfazed, she grabbed a flowerpot and threw it at the lizard. It dropped the owl and bolted away, but the bird did not survive. At least two other instances of monitors eating owls have been reported, and it seems certain that other attacks have gone unseen and undocumented. Back at Repticon, I saw at least five different types of monitors for sale. It’s a family of lizards that has roughly 70 species and only two—the Komodo dragon and the Nile monitor—are now tightly regulated here. FWC classifies the Nile monitor as a Conditional Species, along with only seven other reptiles, including the Burmese python and reticulated python (at nearly 30 feet, one of the largest snakes in the world). These species can’t be sold as pets, but with the right permits you can have them for commercial, research, and exhibition purposes. Dozens of other monitor species—crocodile monitors, Argus monitors, tree monitors—can be brought in and sold, no problem. Two days after we part ways, one of the 11 traps we set nabs a 3-foot Nile monitor that was first spotted climbing a resident’s front door. Like nearly all the monitors Mondgock traps, it was placed into a sealed plastic tube and exposed to a lethal dose of chloroform. Death by asphyxiation—a grisly fate, but what other options are there? Biological invasions aren’t necessarily blitzkriegs. It doesn’t matter if a pet store releases a few dozen lizards or a hurricane damages a breeding facility and sets free hundreds of snakes, as has happened. Some of the invaders die off, scooped up by predators or unable to adjust to their new environs. Others find food, find a mate, and survive. With each new egg that’s fertilized and each animal that reaches sexual maturity, the monetary and ecological costs of the problem go up. Biologists call this the invasion curve, and right now Nile monitors fall somewhere in the middle. Any hope of eradicating them in Florida faded long ago, but it may be possible to keep them contained to a few small pockets around the state: One is in Cape Coral, another is in Palm Beach County, site of President Trump’s Mar-a-Lago resort. Keep following the invasion curve upward, past the point of containment, past the Nile monitor, all the way to the top, and you will find the Burmese python. This apex predator can grow more than 18 feet long and was for a long time one of the most popular snakes in the pet trade. Now there are estimated tens or hundreds of thousands of Burmese pythons in South Florida, and they’re eating everything—rabbits, rats, bobcats, deer, even alligators. On the invasion curve, they fall in the “resource protection and long-term management” section. In other words, they’re taking over, and our only hope is to safeguard what they have not yet destroyed. In 2012, a team of researchers reported in the Proceedings of the National Academy of Sciences that marsh rabbits, raccoons, and opossums had all but vanished from sight in Everglades National Park. One of the culprits, they suggested, was the arrival of the Burmese python, which records show was established in the park around 2000. If that’s the case, it took the snakes just a decade to eat their way through that section of the ecological menu. Now they may have shifted to wading birds for their next course. Those include the federally threatened wood stork, magnificent frigatebird, great blue heron, little blue heron, red-whiskered bulbul, snowy egret, and pied-billed grebe. To date, at least 39 different bird species have been found in the bellies of Florida’s pythons. Nile monitors and Burmese pythons are similar in that they came, they destroyed, and they got regulated. They are cautionary tales, but legislators have been slow to heed the warnings. Case in point: the Argentine tegu, a squat lizard with a taste for eggs that isn’t hard to find on the outskirts of Miami. To get a glimpse of these beasts I’m in the back seat of a White Ford F-150, sitting next to a large plastic container labeled “Dangerous Reptiles.” At the wheel is Brittany Mason and riding shotgun is Sarah Cooke; they are trapping Argentine tegus on behalf of the University of Florida’s Croc Docs lab. The truck lurches along dirt service roads in southern Miami-Dade County, stopping every few minutes so the women can check one of the 150 different traps that are nestled in the bushes. Tegus are bizarre-looking lizards with enormous jaw muscles that resemble jowls. They are omnivorous eating machines that have in the past decade rocketed up the invasion curve and are now so ubiquitous in this stretch of Florida that some grad students refer to it as Tegulandia. There are even tales of a local fast-food joint that became renowned for tegus that burrowed under the drive-through box and scared the hell out of unsuspecting customers. In their native South America, tegus have a fondness for eggs. They raid cayman nests and eat tinamou, a ground-dwelling bird. But as I’m learning today, they seem equally enticed by store-bought chicken eggs. An hour into the trip, Cooke walks down a pile of rocks holding the first trapped tegu of the day, a juvenile that’s 16 inches long, give or take. She shakes the lizard into a canvas bag, tags it with a pink piece of tape, and tosses it into the Dangerous Reptiles bin. About an hour later, the team bags a second, and then a third, taken on the grounds of a firing range. The lizards have already raided alligator and turtle nests in Florida, and the area where we bagged six is mere miles from one of the last populations of the Cape Sable seaside sparrow, an endangered species that builds nests inches off the ground. 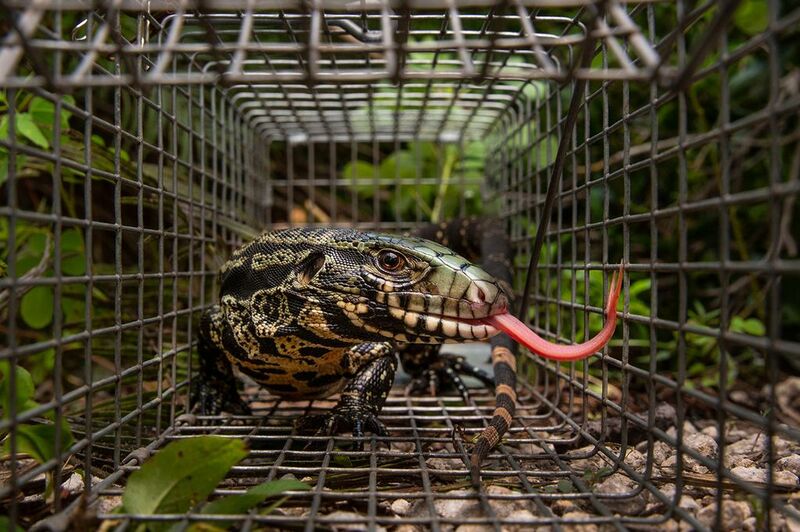 Since 2014, the Croc Docs team has trapped 1,418 tegus. Yet for all the trouble they are causing and all the risks they pose, tegu sales aren’t regulated in Florida. Unlike the Nile monitor and Burmese python, FWC does not classify tegus as a Conditional Species. Head to a Repticon, drive to a pet shop, or jump on Google and you can buy one for a few hundred bucks. 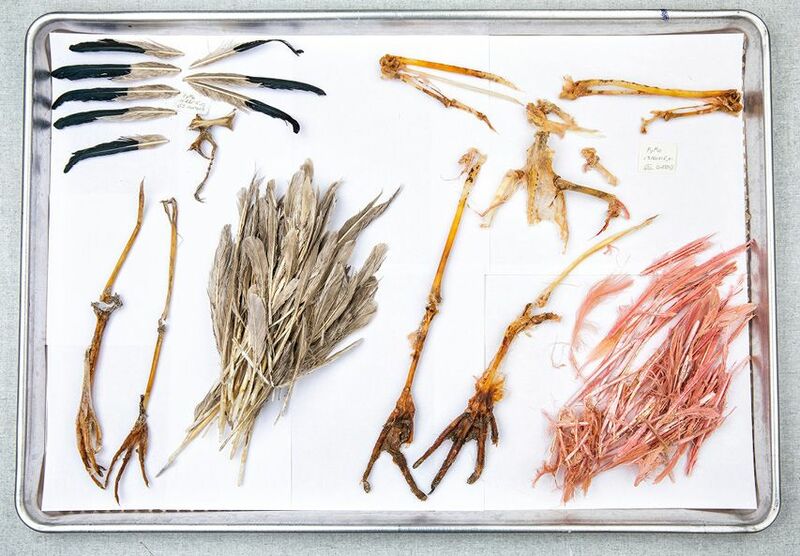 Excerpted from an article that originally appeared in Audubon magazine. Reprinted with permission.